I love how in Norway most families have a cabin. It's a place where you can escape on the weekends with family and friends to ski in winter or soak up the sun in the summer. It's usually up in the mountains or in a more secluded place in the woods or on a lake. Thomas's family cabin is right on the edge of a big beautiful lake. The day we arrived, the temperature dropped and we got a huge snowfall. There's nothing more beautiful than the fresh white snow coating the trees and the rooftops. Their cabin is a TRUE cabin lol. In the summer the water comes from the lake for showers etc., but in the winter time it's a whole new ballgame. They took an ax to the lake close to the shore and we had to scoop up the water and then use it to wash dishes or heat up to wash ourselves. It's kind of fun to do it for a few days but I couldn't do it much longer than that lol. First things first we had to get food to stock the fridge for the weekend. A lot of Norwegians head over the Swedish border in order to save money on things such as alcohol and meat, so that's exactly what we did! The Swedish border is only an hour from the cabin, and even though we didn't see much of Sweden I wanted to say that I've been there! Now I've been to all of Scandinavia :) We got a lot of food for rib-sticking meals like Cabbage, potato, and sausage soup and oxtail stew. It's so cozy to sit in front of the wood burning stove eating comfort food. 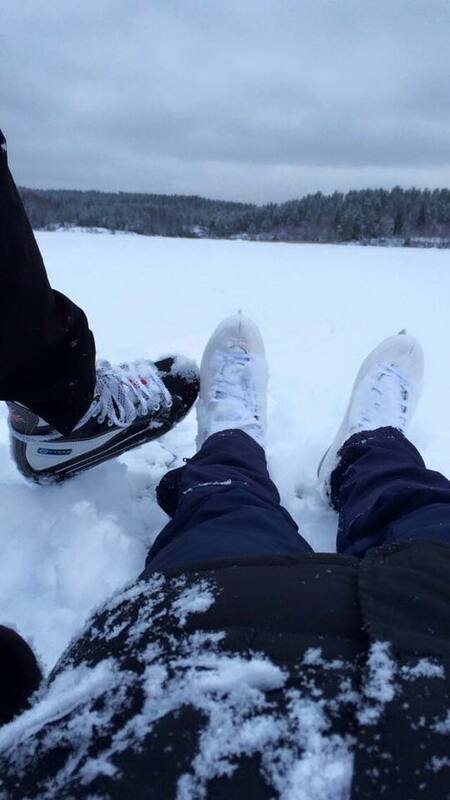 We spent our days ice skating on the lake and riding the "kicker". Being a Florida girl I've never seen much snow much less walked and skated on a frozen lake! Such a cool experience. We went from one end to the other telling stories and showing off our pirouette skills ;) We were in one in-depth conversation and all of sudden the toe of my skate got stuck and I went down hard lol. Complete face plant. Slightly embarrassing haha. So instead of getting up, we both just laid on the snow and ice and took it all in. The one thing I'm sad about is the fact that I didn't see a moose :( We rode around at dusk to try and spot one but no luck. We did see a few deer though so that was nice! Overall it was a perfect weekend getaway and I can't wait to go back in the summertime.